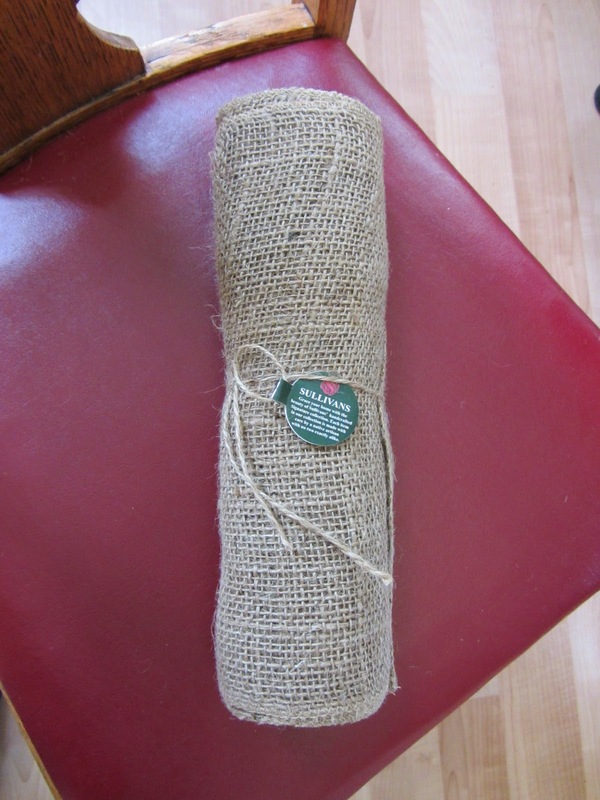 I have been looking at burlap valances for my kitchen lately. This is my current valance. Not too special, red, green, and a mustard gold color plaid. I absolutely love the 3 tier ruffled valances on Etsy for $50 each, and I was very close to ordering, but there are no returns. I think they would have worked but if I ordered a custom size, for sure I couldn't return them. Ballard's Designs had some standard valances in burlap for $19 each. I was very close to ordering these too. I had purchased some wide burlap garland on a 70% after Christmas clearance. The garland was originally priced at $27.25. I thought it might come in handy for projects this year. I got the idea that maybe the garland was wide enough to work for a valance. So I tried them on the skinny cafe rods in my kitchen with clothespins. I liked the look enough to cut the garland in half, and hem the ends with iron on hemming tape. I also used a stain pen and antiqued the light wood clothespins a bit. This project is costing me about $8. Here is the burlap garland/valance I created today. This is the original price tag. Remember I got this for 70% off in an after Christmas sale. The garland was 11 1/2" wide. Update: I just added this photo of the other kitchen window as an afterthought when I received a comment about my great spoon above the first window photo. This window has the matching fork. 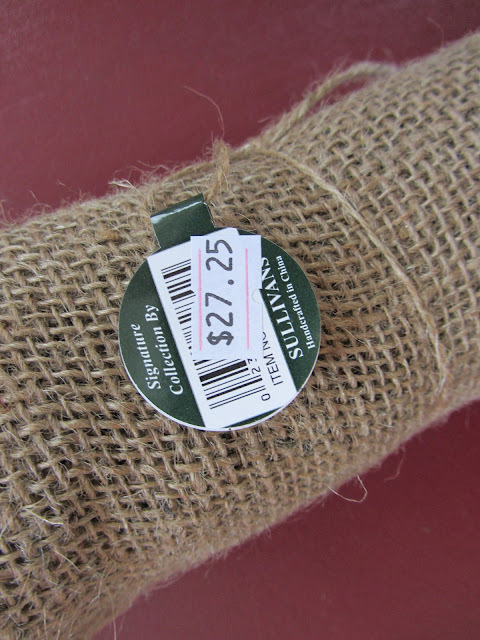 Considering the savings, I might just try these out for a while and get my burlap fix! Great idea. I love all the ways burlap can be used. Your valance is cute! Those are really great, and I can see them dressed up for spring with flowers glued on the pins or add other things for holidays. 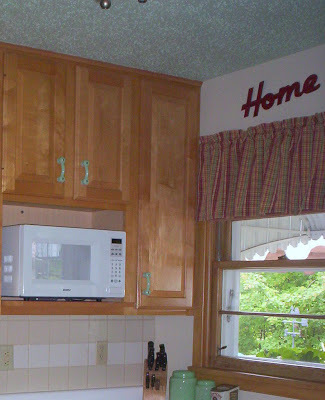 Not only is it great that there was so little work involved making your valances, but if you want to change the look, changing the pins would be a quick and easy way to do it. Thanks for sharing your decorating idea with us. 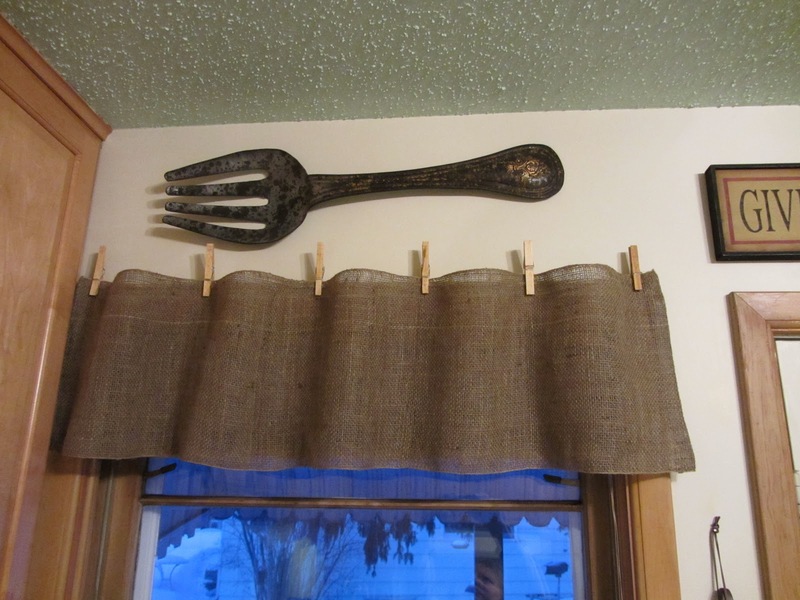 I have the matching fork over the other kitchen window. Thanks for commenting. How cute! 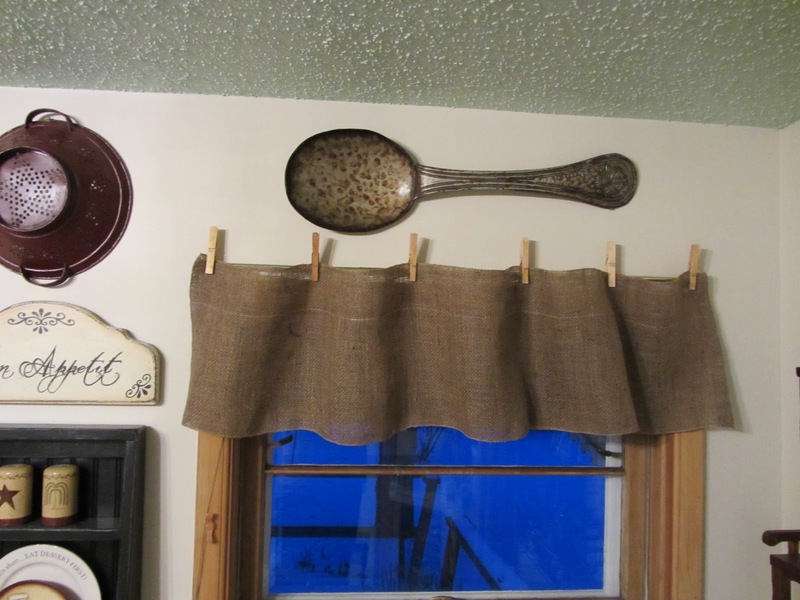 I love how you hung the valance with clothes pins! Thanks for sharing with my newbie party. Thanks Debbie. 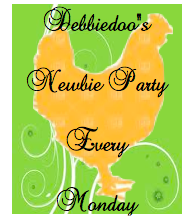 Love the newbie party! You did a great job with the valances! I am following you now via Debbie's party. Have a great day! Thanks Mary. I'm glad you are a follower! This is too adorable, whenever I see burlap I just have to come over and look. I love your valance and the clothespins. What a creative idea. Also love your spoon/fork about it, and those cute little chairs you have by the spoon window. I'm a graduate of the party, but have my fingers crossed that you will consider sharing this at Sunday's Best party going on right now. Love this! Changing curtains is one of my favorite ways to change a room up. Easier and muchless messy than painting and sometimes cheaper! Thanks for sharing, I'm still thinking about floor to ceiling cream burlap curtains in the living room. I'm your newest follower! Thanks! I have heard that floor to cd ing burlap are really heavy. I think they would look great though. Hi, Carlene! What a great idea, very creative! I hope you don't mind me asking where you bought this at 70% off? I'll have to be on the lookout for it next Christmas. I'm your newest fan! Please stop by bellanest.blogspot.com if you get a chance. I got the burlap at a local floral and gift sup. It is made by Sullivans item RB 113. I made both out of the one garland. Thanks for following. I will check out your blog. That's local floral and gift SHOP! Carlene that is so nifty, I would have never thought to be so creative. I'm your newest fan. Your window treatment is so cute! I love how you used the clothes pins. They are super easy Dee! This is so cute! I just love the idea of using clothes pins. I also love your big spoon! I have a fork, a knife and spoon painted on canvas in my kitchen as well. Love it! Super cute! Thank you for sharing your lovely project at Potpourri Friday! What a cute and easy idea! Love the clothes pins. we need to paint or decorate the clothes pins, too!!! These are adorable! I've been contemplating making some for my kitchen. I'd like to leave a "frayed" edge but don't want it to look too rustic. I love the clothes pins! I'm gonna go home and play around with them for sure! 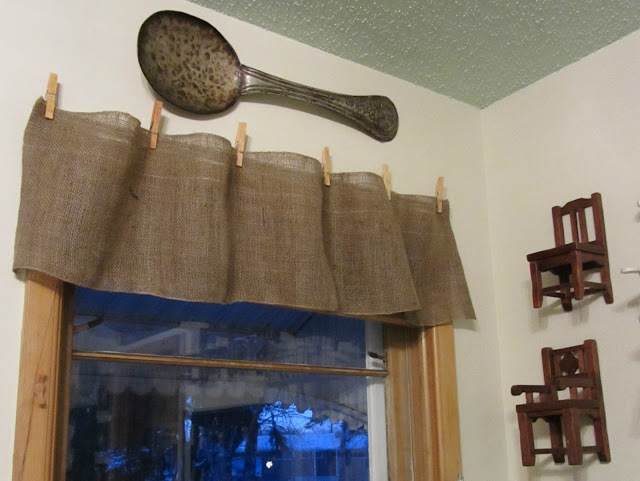 I know this is an old post but I thought how cute the valance would be with a large sized rick-rack border!